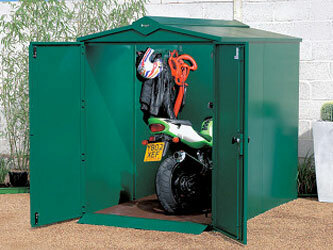 The Centurion provides the perfect storage solution for a multitude of applications. The quality and robustness of this unit are its strength. Made from high quality galvanised steel and coated with a tough polyester textured weatherproof coating, protecting against rust for a minimum of 10 years. Trusted especially by schools and motorbike enthusiasts nationwide you will be hard pressed to find anything to beat it on the market today. Double doors the width of the unit allows maximum access into the unit and a ramp is provided for easing in wheeled or heavier items. Available in Dark Green, Dark Brown and Ivory. Installation must be on a firm level surface.